Named after the late Philip Tranter (who’s generally credited with starting it), Tranter’s Round (that’s Tranter's Round with a straight apostrophe for search engines) takes in the peaks of the Mamores, Grey Corries, Aonachs, Carn Mor Dearg and Ben Nevis and can be thought of as the original 24 hour Scottish mountain challenge. Although the elite hill runners have now moved on to Ramsay’s Round, Tranter’s (at upwards of 36 miles and 20,000 feet of ascent) is still both a taxing expedition and a very worthwhile objective for the rest of us! My first attempt (leaving Achriabhach at 03.45 on 18 June 2005) finished as just another Mamore traverse after a frustrating day when constant low cloud failed to lift as forecasted and much time was lost to navigation. So I was keen to have another crack at it while the days were still long, but Sunday 3 July was the soonest I could go and it took considerable faith in an improving forecast after a wet and windy morning to do so. In the event, conditions were ideal for a fast Mamore traverse with good visibility all the way, most of the Grey Corries were done in the dark and most of the rest (apart from a pleasant sunny break on the Carn Mor Dearg Arete) was completed in cloud. Achriabhach 15.30 0:00 00:00 Although Tranter’s Round is commonly done from Glen Nevis Youth Hostel, Achriabhach (the Lower Falls) is the original start/finish point. 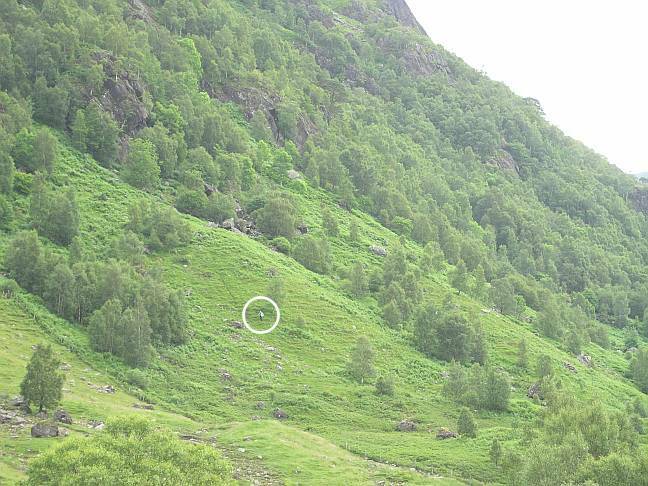 While it’s also technically shorter this way, be warned that it finishes with a more difficult descent off Ben Nevis! Sgorr an Iubhair 18.09 0:21 02:39 Perhaps illogical to time Sgorr an Iubhair (now it’s no longer a full Munro) and not the Grey Corries tops, but why not? Stob Coire a’ Chairn 18.50 0:24 03:20 4 minute break at top to phone Noel. Sgurr Eilde Mor 21.14 0:47 05:44 4 minute break in Coire a’ Bhinnein to refill water. Stob Ban 00.05 2:00 08:35 16 minute break on Stob Ban to sort out torch, GPS, jacket and gloves and empty shoes of accumulated gravel, after which sparks flew (as promised by Noel, who I phoned just short of the top) while descending scree to the NW! Slow progress overnight (kept losing path through rockier ground) followed by 4 minute break on Sgurr Choinnich Mor to pack up torch etc. Aonach Beag 05.10 1:32 13:40 Taken direct by scramble up Stob Coire Bhealaich. Aonach Mor 05.36 0:26 14:06 3 minute break at top of Aonach Mor, 4 minute break on descent from Seang Aonach Mor to refill water and 4 minute break at col before Carn Mor Dearg to empty shoes. Ben Nevis 08.08 1:15 16:38 4 minute break at summit to check paper navigation to Carn Dearg SW because of poor GPS coverage. 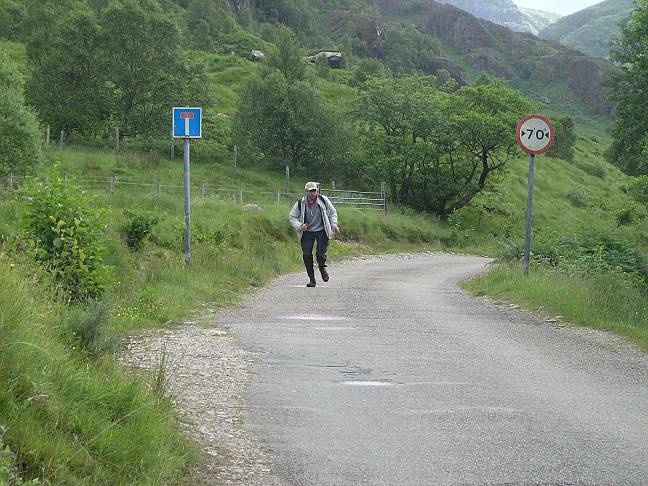 No problems finding that (leave pony track where it takes an obvious sharp right turn at top of Five Finger Gully), but a frustratingly slow descent (largely responsible, along with the time lost on the Grey Corries, for turning a 16 hour round into an 18 hour one!) through thick bracken and awkward ground after picking a poor route through Polldubh Crags. While I can’t swear that it’s perfect (think Sgurr Eilde Mor to the second Stob Ban should go quicker on a 15-hour round but can’t test that by extrapolation from my Ramsay’s times), it represents a much more consistent pacing than my recorded Tranter’s, should be doable by anyone capable of that kind of finishing time (on which note you’d really need to be doing 15 or max. 16 hours to be considering a 24-hour Ramsay’s) and should scale appropriately (much better than what I actually did) for other finishing times. So try adding 1, 2 or 3 minutes in 5 for 18-, 21- or 24-hour schedules respectively (or maybe re-evaluate the last alongside Naismith’s rule for a ‘walking’ round where ascent and descent times may not stay proportionate) and see how that works? As for fluid, I carried a 2 litre Platypus of water as well as the Lucozade, refilled this twice and one of the Lucozade bottles about three times, making a total of about 8 or 9 litres drunk. Now, that might sound a lot but, even so, I’d started to feel dehydrated after hoping (but failing) to find water for the last fill between Sgurr Choinnich Beag and Aonach Beag and subsequently being thankful to find a good supply running down beside the descent path from Seang Aonach Mor to the col before Carn Mor Dearg. Not really much to say here except to reinforce the obvious, which is that things keep getting tougher as the distance covered and height climbed starts to build up! So the Mamores flew by in fine style with a mixture of (mostly) brisk walking uphill and jogging/light running down, but I couldn’t see well enough to run any of the Grey Corries until hitting the grassier western flanks of Sgurr Choinnich Mor and Beag in the returning daylight. While the last group of peaks from the Aonachs onwards may be fewer in number, they’re the biggest and (apart from the long traipse from Binnein Beag to the second Stob Ban) involve the greatest reascents, meaning that I ran less and less towards the end. To which I might just add that the required speed over the ground for Tranter’s Round isn’t that high, the key is ultimately to keep moving (which I certainly did) rather than to run, and Naismith’s rule says you should be able to complete it in about 22–23 hours. While mobile phones are potentially useful when you’re out on the hill, they’re also potentially unreliable because the signal comes and goes. So I can’t remember offhand what it’s like in the western Mamores but I don’t think I’ve ever had a useable (Vodafone) signal in the eastern Mamores or upper Glen Nevis. That said, things seem to be better from the Grey Corries onwards and I was able to take/make further calls (in addition to those listed above) from/to Noel on the col between Sgurr Choinnich Beag and Aonach Beag and summit of Carn Mor Dearg respectively.